The trend in restaurant interior design has shifted in recent years from contemporary and traditional designs to a more modern, industrial motif. This design shift has been inspired by a range of factors. One point of inspiration is the passionate foodie culture, who have come to expect more from restaurants than gourmet cuisine. They also demand a more aesthetically pleasing décor and they want to eat in a space that’s as inspiring and unique as the food is. This sophisticated group is looking for a design that’s edgy and contemporary. Another factor influencing the modern industrial trend is an inclination to more geometric shapes and patterns. This is in part to take advantage of the long linear shapes of many restaurants that have popped up in tight urban areas. This applied geometry uses horizontal lines to make such narrow spaces seem bigger. The design also extends to everything from light fixtures and furniture to compliment the interior décor as well as the modern architecture of the space. Popular seating for this type of décor includes Bistro Metal Chairs and Bar Stools. Theses restaurant chairs and bar stools along with similar contemporary chairs such as Modern Oval Back Metal Chairs and Bar Stools have modern design that flows with the minimalist approach to restaurant interior design. These commercial chairs and bar stools go well with rectangular and square solid wood table tops that show the grain and have eased or bullnose edges. Another popular complement to industrial seating are granite table tops for a more upscale look. Alternatively, resin table tops have a sleek, contemporary look that fits in with modern, industrial design that is ideal for bars and quick service restaurants. This is not only because they are more affordable, but they are also very durable and are scratch and stain resistant. Modern Industrial décor is attractive to many restaurateurs because it is easy to combine in with other types of décor whether it’s rustic or traditional motifs. The philosophy modern industrial design is that the look is more authentic. The glossy finish of Bistro Metal Bar Stools and Chairs blend in perfectly with traditional décor such as and wood table tops. 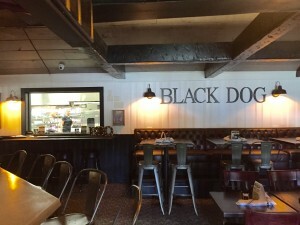 The Black Dog Bar and Grill in Putnam, CT is a good example of a restaurant that effectively blends modern industrial seating with traditional restaurant furniture such as Button Tufted Back Booths. They also incorporated Chrome Backless Swivel Bar Stool, Bistro Style Metal Bar Stool and Chairs and Solid Wood Tables. Some say the growing trend of restaurateurs and their clientele towards modern industrial décor is part of a back to basics movement that is growing in popularity. This applies not just to interior design but also for many restaurants as a way of cooking and preparing food, using natural, locally grown whole ingredients and emphasizing quality and substance over fads. Modern industrial design is growing as a trend unembellished materials are a logical accompaniment to unembellished food. It is a perfect fit for farm to table restaurants, gastropubs, bistros and cafes that are trying to achieve a less pretentious, authentic look that conveys a feeling of honesty that pride themselves on their craft whether it’s brewing craft beer or baking artisan pastries. Modern industrial décor embodies a minimalist appeal that allows it to be infused into any type of restaurant and with any motif. Whether you have a chic upscale bistro or a family diner, there are ways to infuse some of this type of furniture into your venue to enhance your décor’s aesthetics and add value. You will reach out to a larger clientele that is typically upwardly mobile and has more disposable income without alienating your core customer base.